Vac-Stac Series of venturi vacuum pumps are designed specifically to integrate with all ISO 5599/1 Size-1 directional control valves. 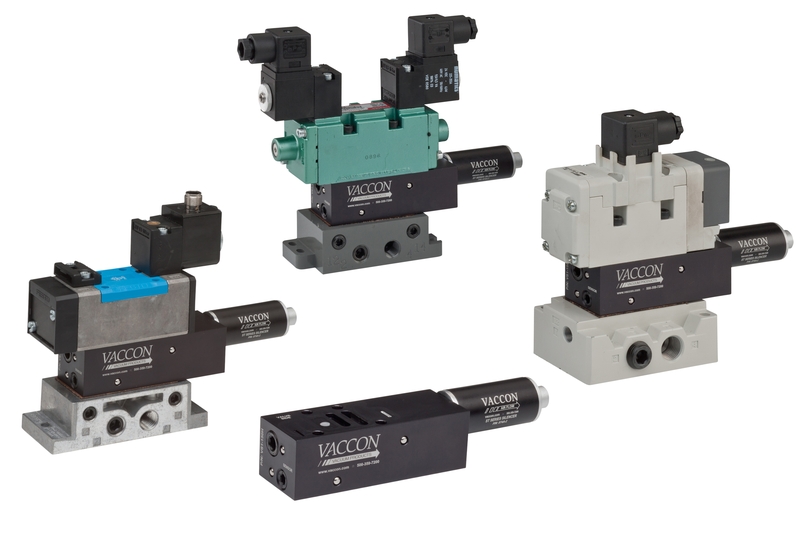 Vaccon's Vac‑Stac pumps provide the quickest and most efficient way to incorporate vacuum with individual ISO valve bases or manifold assemblies for automation applications including pick & place and material handling operations in packaging, automotive and food processing industries. Similar to “sandwich” flow control valves or pressure regulators, Vac-Stac pumps offer Original Equipment Manufacturers (OEMs) and machine designers an efficient solution to control air and vacuum in one compact unit. Modular, lightweight and easy to install, Vac-Stac pumps are compatible with any manufacturer's ISO 5599/1 Size-1 valves including SMC, Numatics, Festo, Parker and others. Vac-Stac pumps eliminate the need for separate vacuum pumps and air lines, minimizing the number of pneumatic components and fittings saving money, time, and space. Installation is quick and easy, simply remove the ISO valve body from its base, mount the Vac-Stac pump to the valve base, and reattach the valve body to the combined pump/base. Vac-Stac pumps add less than 2 inches to the valve stack height and can be easily retrofitted into existing equipment and systems. Vac-Stac pumps are available in 11 different performance levels up to 28” Hg [948 mbar] vacuum level and 3.2 SCFM [90.6 LPM] vacuum flow. As with all Vaccon products, the Vac-Stac series pumps operate continuously without maintenance or costly filters, eliminating downtime, increasing productivity and improving profitability. The ISO 5599/1 valve top must be separated from the valve base to install the Vac-Stac venturi vacuum pump. Please refer to ISO 5599/1 valve manufacturer’s documentation for instructions. Dimensional data for the Vac-Stac Series Venturi Vacuum pump is presented in 2D drawings, with all critical dimensions and port thread sizes displayed. Both imperial and metric units are included. Performance data for the Vac-Stac Mid Series Venturi Vacuum pumps is displayed, listing air consumption, vacuum flow at various vacuum levels, and evacuation times (for 1 cu. ft. or 1 L volumes). Data is presented in tabular and graphed formats, in both imperial and metric units.